Yes, Good Friday was yesterday. But let’s take another look at Jesus’ march to the cross. Human nature wants us to move on and get to the resurrection, get to the wonderful Easter story! We are uncomfortable with suffering, agony and death. But it is worth at least a second look. Maybe there is more to the cross than we realize. Earlier Jesus told the people that in order to be his disciples they must “deny themselves, take up their cross and follow Me” (Matt 16:24). And then He did it. He denied Himself. He took up the cross. He followed the Father’s command. 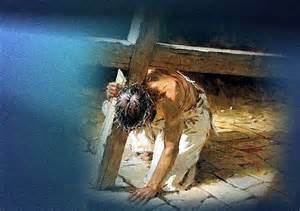 Note how He suffered: physically, emotionally, psychologically and spiritually. He suffered in every way possible. But that suffering led to life and redemption. You and I will suffer in this life. It is inevitable. Sometimes we will suffer because we choose to do what is right and good. Sometimes suffering will come to us; for no apparent reason. But God has a purpose: He wants to use that suffering to bring a greater sense of His presence, His character and love into our lives. It helps tremendously to know that our God suffered all that we go through and more. When we suffer we can have the fellowship of Jesus to carry us through. Are you suffering? Invite Jesus into your suffering and let Him “fellowship” with you. Let Him renew your mind and transform your character. That Cross will someday become a Crown if you turn your eyes upon Him.